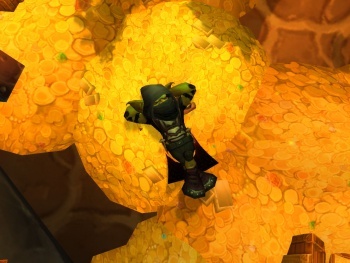 Katrina Fincham made over $75,000 farming gold in World of Warcraft, which she ironically converted into bars of gold bullion. Katrina Fincham, an Australian nurse, made over $75,000 farming gold in World of Warcraft. When the piles of cash started pouring in from her little side business, she decided to make her assets a little more solid, purchasing $75,000 worth of solid gold bullion. It would have been a sound investment... had the gold bars not been stolen from a wall safe in her Adelaide home. Gold farming is a perfectly legitimate practice in Australia - as long as farmers include details on their annual tax return. As such, Fincham had the gold bars that she earned through her farming insured legally through insurance company AAMI. But AAMI is refusing to pay up, accusing Fincham of only converting the money into gold bars so that it could be purposely stolen. Fincham sued her insurer, who proceeded to issue a counter-claim, accusing her of insurance fraud. Fincham had previously set up a real-world business: Virtual Item Sales, in which she would often work late hours to meet online demand. On any given night, she claimed to make multiple exchanges of up to $700 each - and she'd be paid in cash, finding checks or money orders inconvenient. With the advent of the lawsuit, Virtual Item Sales has collapsed, as her former customers are now constantly being harassed by insurance investigators. Fincham has had to sell her house to cover the costs of the lawsuit. To add insult to injury, it turns out that it was an inside job after all, though Fincham herself had little part in it. Her then-boyfriend, who she'd met online, tipped off the criminals in exchange for a paltry $500.